Are you up for the [savings] challenge? This challenge is designed for our Teen Account members to help you build a financially successful future. Because who doesn't want more money in the bank? 1. 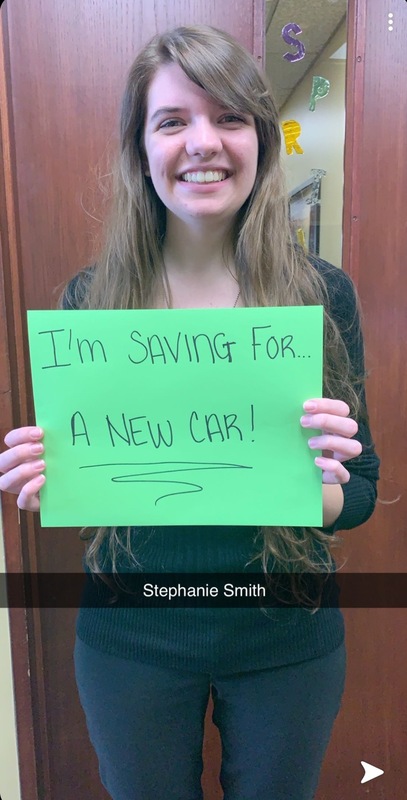 Send us a picture of yourself and your savings goal. We believe setting and writing down a goal is the best way to achieve it. Emailing us a picture with your savings goal written on a piece of paper (or hold up a pic of what you're saving for ... maybe college, a car, or vacation!) Make sure to include your full name. Using SnapChat, Twitter, Instagram, or Facebook. Just make sure you include your full name and savings goal. 2. Start saving! You can download our Tracker Sheet to help you reach your savings goal. Print one off or pick one up at any branch location when you stop by to make a deposit. Every $50 you save can become an entry to win the $100 cash deposit at the end of the Savings Challenge, plus additional prizes along the way. There is no dollar amount requirement for your savings goal and you aren't required to obtain it, but you must set one for this challenge. We need to have your full name and savings goal in order for you to qualify for the Teen Savings Challenge. When the challenge ends, you will receive an entry for every $50 you've saved. Check back soon for additional details, Tracker Sheet download and more! The Savings Challenge runs May 1 - July 31. Don't have a Teen Account?